Punjab Revenue Minister, Bikram Singh Majithia today launched a scathing attack on Delhi Chief Minister and Aam Aadmi Party (AAP) convener, Arvind Kejriwal. He said that the Sikhs are getting respect and recognition in America, England and Canada but it is really a matter of regret that Arvind Kejriwal has completely ignored the Punjabis who have a history of making 80 percent of sacrifices for the freedom of nation. The narrow thinking of kejriwal regarding Sikhs is clearly demonstrated from the fact that he has not included a single sikh in his cabinet. In such a scenario,what can the Sikhs expect from Kejriwal?Interacting with the media persons while distributing grant of Rs. 60 lakh to village Kathunangal, Rs. 20 lakh to Adda Kathunangal, Rs. 21 lakh to Kathunangal Khurd and Rs. 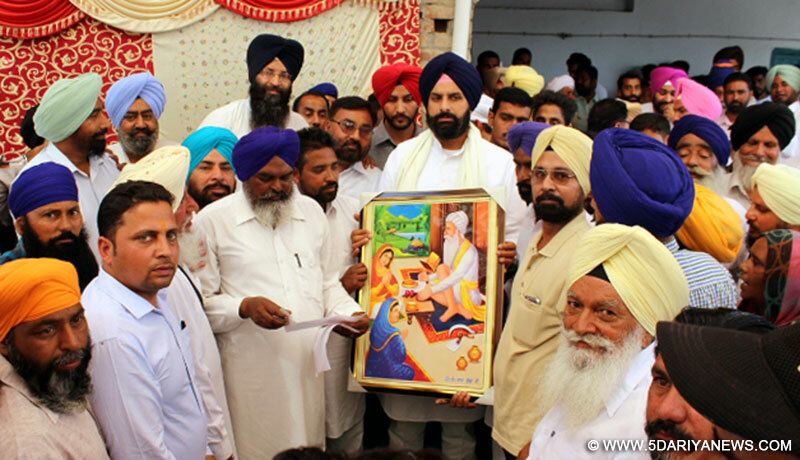 44 Lakh to Village Jhande in Majitha constituency and laying foundation stones for scores of other development projects, S. Majithia said that the politics of kejriwal is totally centered on lies, drama and crushing the feelings of Sikhs. Calling kejriwal inimical to Punjab, Punjabi and Sikhs, S. Majithia said that instead of showing solidarity with Punjab and Sikhs, kejriwal has cheated them and meted out step motherly treatment to them. Divulging more, S. Majithia said that kejriwal does not repose trust in Punjabis and instead of according prominence to Punjabi people, he has given preference to non-punjabi people in Punjab who don’t have any sort of connection or sentiments with issues facing Punjab.Taking Kejriwal further to task, S. Majithia said that people of Punjab would never forgive AAP convener for betraying the interests of State on vital SYL issue. He also disclosed that the so called sympathy being shown by Delhi Chief Minister towards Sikhs is nothing but a farce as he (kejriwal) is patronizing anti-sikh forces in Delhi. Questioning kejriwal, S. Majitha said that isn’t losing of a file related to SIT, formed for probing 1984 massacre, part of an attempt or deal to save tytler? Further lambasting kejriwal, S. Majithia said that while the Delhi Chief Minister patted himself on the back by launching an advertising campaign concerning compensation to 1984 massacre victims with the funds released by center, but has even a single victim been rendered any help by Delhi Government? He expressed confidence that sensible people of Punjab would never fall prey to the political scheming and mechanizations of kejriwal.On this occasion, Talbir Singh Gill, Major Shivi, Gurvel Singh Alkarey, Kuldeep Singh Kathunangal, Prof. Sarchand Singh, Sarpanch Avtar Singh Kathunangal, Sarpanch Bibi Kulwinder Kaur Jhande, Sarpanch Baldev Singh Kathunangal Khurd, Sarpanch Harinder Kaur Adda Kathunangal, Prem Singh Jhande, Prabhpal Singh Jhande, Major Singh Kaler, Zora Singh, Ex-Sarpanch Kanwaljit Singh, Joginder Singh, Kashmir Singh, Dr. Rajpal, Nambardar Dalbir Singh, Sucha Singh, Harjinderpal Sarin, Boota Singh, Rajkumar, Karnail Singh and Narinder Sokhi were also present.